TU/e Campus will be an attractive meeting place for students, researchers and entrepreneurs, in the middle of an open and green site, with the atmosphere of an urban park, close to the center. All departments and student facilities will be centered along the full length of the Groene Loper. A number of existing buildings will be renovated and some new buildings will be erected. For existing buildings the aim is to retain as much of the present materials as possible, supplemented with redeveloped portions of the existing premises and new, sustainable materials. The approach adopted for new buildings is to pursue optimal energy neutrality. There are four large projects. 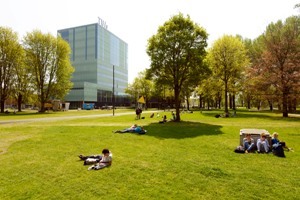 The Groene Loper is intended to create visibility for the Strategic Areas of the campus as a Living Lab, by means of the ATES system, brainboxes with independent power supply where work and meetings can take place in the open air, intelligent solutions to separate the traffic flows, a Scenic Walk with innovative and sustainable materials and lighting. The covered section of the Groene Loper, 'the Forum', will form a show garden for the research that is conducted at TU/e.